When I think about how I (and so many other boomers) mistreated our skin when we were younger, I cringe. Sun reflectors, baby oil mixed with iodine, endless hours spent laying prone at the hottest time of the day, waiting for the burning rays to penetrate our skin and make us tan and look better. Or burned, in my case and so many others with pale(r) skin. And now we see the fallout of sun worship: premature aging, lines and wrinkles, age spots, and at its worst, skin cancers. Get out of the sun. Yes, it may sound obvious, but as soon as you feel a sunburn, you need to seek shade and avoid further sun until your skin has healed. Cool it down as quickly as possible. Just like with any type of burn, apply a cool compress (a frozen bag of peas is great to keep on hand!) as soon as possible to ease the sting and draw heat out of the burn. Taking frequent cool showers and baths using cool water helps, too. But don’t take a bubble bath, which could be irritating. Instead, mix in some baking soda or about one cup of vinegar, which can help soothe inflamed skin. Something like this from Aveeno , which contains oatmeal, can help, too. Keep your skin moist. Once it’s burned, damage has already set in. Applying the moisturizer right after a shower or bath to damp skin will help lock that much-needed moisture in. Best moisturizers to apply include those with ingredients like aloe vera or soy. This one by Burt’s Bees contains soothing ingredients like aloe and coconut oil. Plain petroleum jelly works, too. Stay away with products ending with ‘caine’ like benzocaine or lidocaine; these can be irritating or cause allergic reactions. 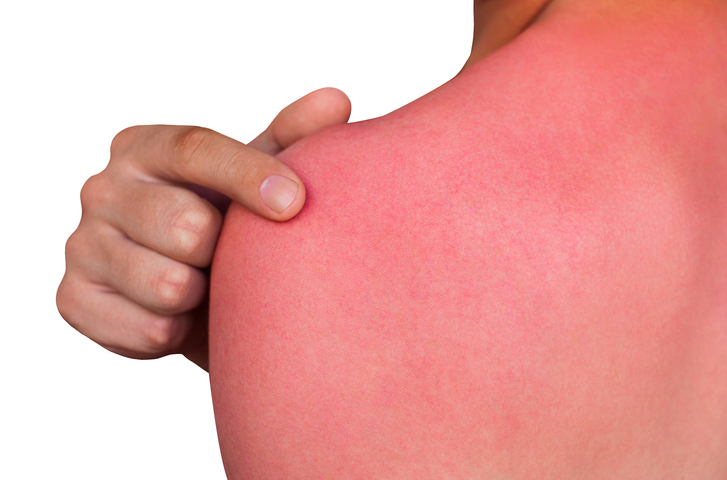 If your sunburn is so bad that it blisters, don’t pop the blisters – they are nature’s way of repairing your skin. The fluid in the blister contains growth factors, in fact, which helps the skin heal. Once the blisters pop, don’t pull off the remaining skin, either; that’s there to protect the tender skin underneath. Keep the skin covered with petroleum jelly to protect it while it continues to heal. Drink plenty of water to replace the fluid the sunburn draws away from your skin and your body. Eating water-rich foods, like watermelon, honeydew and cantaloupe will supply lots of hydration as well. I’m currently obsessed with this watermelon water; it’s so so refreshing, especially on a hot summer day. Remember, there is no such thing as a “healthy tan.” Even darker-skinned folks who never burn can still suffer the effects of too much sun exposure. As soon as the sun hits your skin, it begins to create changes that you cannot see. Be careful out there, and always protect your skin with sunblock, which needs to be applied about 20 minutes before going out and after two hours of sun exposure. Hats, sunglasses and clothing all contribute further to protecting yourself.